The response to Ms. Coulters' anti-soccer article seems to have hit a bit hard to those who don't like her to begin with. She's now written a second one. Check it out! A week ago, I did a small article in support of her view. One fellow seemed a bit put out about it and posted an opinion ... Which I promptly deleted. 2. An ANONYMOUS opinion is, to me, quite another. Please don't make statements here without "showing your face". I won't go after you. I won't give you hell for it. Just be open about it. 3. 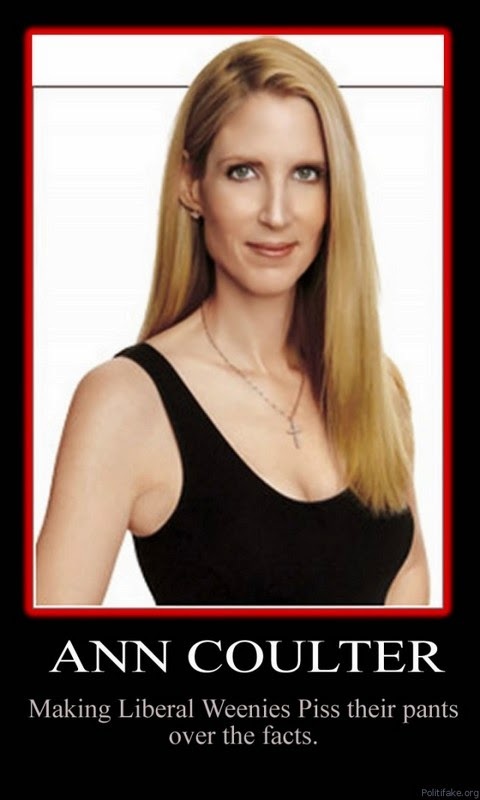 An anonymous opinion coupled with a product suggestion (In this case an anti Coulter book. In and of itself nothing wrong with it.) and a link to a website extolling such is ... SPAM! Ms. Coulters' initial anti-soccer article here. Her follow up article here. Go to Jays' Tee Vee blog main page here. Ifn' there's a buncha' articles under this 'un, yer already there.